I just remembered the name of an eccentric, bohemian woman I met in Palenque, Mexico many years ago. Her name was Hilda and she was the person who told me about the mystical place called Huautla de Jimenez in the mountains of Mexico. I referenced this place in another account called “The Reluctant Curandero”. She also went by the name “Coco” when she was with the Mezatecas. Hilda ran a little cafe in the jungle. Only vegetarian, bottled soft drinks, and cerveza. The cafe was open-air in the jungle. All the tables and chairs were made of large tree slices, and there were some hammocks around. You really didn’t feel like you were in a cafe at all, but more like you were relaxing in the thick jungle, only with amenities. There was a basic kitchen behind a simple bar, and a small cottage attached. Hilda made the most amazing vegetarian dishes. I wasn’t even vegetarian, but I recognized the culinary artistry to make healthy food taste like pretty much anything you wanted it to taste like. Hilda was a wizard with many things, and the culinary arts was definitely one of them. I was staying down the road at Maya Belle in a palapa hut and sleeping in a hammock. On a previous trip, Hilda had told me about a near total eclipse that was to occur right there at the Palenque ruins on July 11th, 1991. She said I ought to try and be there for it, and I managed to make it all the way back a week before the eclipse would occur. The only problem was that I’d been robbed on the bus. Nothing violent, just wasn’t paying attention and left my bag untended while I got off the bus to use the restroom. Or something like that. I didn’t lose everything, but there was only enough money for a bus back to Texas. I’d have to miss the eclipse I’d come so far to witness at one of the most mystical Mayan ruin sites I’d been to at that point in time. There was some hidden money in my backpack, and a few travelers checks left. I calculated that if I stayed in the simple open-air palapa for about a dollar a night back then, and took the least expensive buses all the way back up to Texas, I could just barely make it a week if I didn’t eat anything. Once I got back over the border, I could get more money for the last portion of the trek back home to Austin. A week without food was going to be a stretch though. I didn’t even have enough extra to get some cheap food items from the local produce market. So close to being able to stick it out, but about $20 short of being able to pull this off. I’d already paid for the first night in the palapa and planned on catching the first bus out in the morning. Sadly moped back to Hilda’s cafe to lay in a hammock and enjoy my last evening in the jungle. The stars were incredible and I could hear howler monkeys making this omnipresent, low pitch that sounds like the entire jungle is snoring. The insect buzz comes alive with this almost electronic drone that overtakes the senses. The jungle at night is an extraordinary thing to experience. You sort of just melt into the surreal soundscape, while fireflies, and random eyes glowing in the dark forest underneath a thick blanket of stars. And I was going to have to leave early after only one night. There were some other backpackers, a hippy couple from Montana, a girl from Australia, a cigar puffing grad student from Indiana, and I couple of brothers from Austria. We’d all sort of been hanging out for the day since we were all palapa neighbors and kept running into each other at either Hilda’s cafe, previous destinations before Palenque, or around Maya Belle. They were all sitting around Hilda’s cafe having some cervezas when they overheard that I was going to able to stay for the clips. They all raised their beers and cheered at my great fortune as Mario brought me the first free beer of our trade. I’m not sure why this little group so quickly formed a bond as if we’d known each other for years. It might’ve had to do with none of us were of the dreadlocked bongo-playing variety of backpackers. None of us spoke Spanish with much fluidity. We all just clicked I guess. At night we’d either chill out at Hilda’s cafe, or the cafe at Maya Belle… and then late at night we’d convene at whichever palapa was the most convenient or had a nice fire going. We’d talk about what each of us had experienced that day, and the Anthropologist grad student would fill us in on what was known of the Maya from their ancient book called The Popol Vuh. “Many years ago there was a crystal skull found a this ruin site. It was taken away and many bad things have happened since then. He got visibly a little agitated at my incessant questions at this point. The turbaned man jumped back into the taxi without saying anything else to me, and then ordered the taxi driver to proceed toward the ruins. That night at Hilda’s cafe I asked around and confirmed that there was indeed a woman from Nebraska there, and that she was believed to be the reincarnation of Guadalupe. So odd, I thought. Not that it mattered, but I asked what she looked like. Wondered if she was even hispanic. They said she wasn’t hispanic and looked pretty much like any average middle-age housewife from Nebraska. Joined up with the group I’d been hanging out with. They were already seated around one of the rough tree-trunk tables and drinking cervezas. The anthropology dude fancied himself some kind of Indiana Jones character… with a jungle pith helmet, mostly khaki garb, and puffing on a cigar. I’m not sure that he realized that he looked a bit pretentious and well… silly. Yet, I liked out he kind of stood out from everything else in this scene. Caught the eye of a woman with dark, olive skin. Her eyes were smoky and a bit sunken into shadow, but sort of attractive… or maybe spellbinding is a better description. She was dressed all in white flowing fabric that you could almost see through like muslin cloth, and her hair was wrapped in the same white cloth in sort of a loose turban fashion. Noticed she was staring at me and smiling. At first I thought maybe she was just observing our little group… or maybe she was amused with the Indiana Jones dude’s get up, but her eyes were definitely locked with mine. I pointed to myself to confirm. She nodded in affirmation. The others didn’t notice and were all half intoxicated and in the middle of a loud conversation. I walked over to the woman’s table and sat down. Asked what she wanted, but she said nothing. Just kept staring at me and smiling… somewhat seductively. I wasn’t sure. She didn’t answer any of my attempts in English or Spanish to make conversation. Staring and smiling. I was about to head back to the table when she slid her closed hand across the table toward me. She slowly turned her and over and opened it. In her palm were three small mushrooms. She motioned for me to eat them. Although I’m no stranger to the magic of mushrooms, normally I would’ve asked a few questions, got a better feel for the intent of the person giving them to me, and made sure of what I was about to eat was reasonably safe… or, at least not poisonous. This time I didn’t. I just stared back at her, picked up the mushrooms and ate them. The turbaned woman in white nodded affirmatively, then stood up and sort of floated away into the night. At least that’s what it looked like with the flowing muslin like cloth and the way she moved so effortlessly. I returned back to the table and tried to catch up on the group’s conversation. Didn’t even seem like the group had noticed me gone, or the strange woman in flowing muslin white. The anthropologist was pontificating about something and the Australian girl was making fun of him a bit. We all had some great laughs over more cervezas. Maybe less than an hour later, I started feeling a little bit queasy. I’d completely forgotten about the mushrooms the woman in white gave me. I knew what the effect of magic mushrooms should’ve been, but this wasn’t it. Well, it was to some degree. My head spun and I definitely felt drugged, but not in a pleasant way or in a way I’d known before. Hadn’t mentioned to the others anything about the woman in white yet and didn’t feel like I could communicate. Thought I was going to pass out or get throw up. Walked out into the night toward the edge of the jungle for some privacy. My head spun even more as I scrambled into he jungle a bit further from the light of the cafe. Went in a further than I really needed to because I didn’t want anyone to hear me vomiting. In my rushing scramble, I slipped on a moss covered rock and fell down pretty hard. The fall was broken by my knee making contact with the sharp edge of another rock and cutting pain shot up my leg. My knee felt wet from mud and kind of sticky warm. The others came rushing toward me. I did have a good deal of jungle mud all over me, but my knee was split wide open with blood gushing out. Someone handed me a cloth to put over my knee and helped me to a chair. Hilda came over and took the cloth off to examine the extent of the damage and clean off some of the mud. “Oh no… you should’ve have gone over. “Hold this on your knee, I’ll be back in a moment. Hilda took a flashlight and went toward the back of the cafe to cut some plants. She came back and started scoring some of the leaves and fronds with a knife in a criss-cross pattern until they oozed. Then, she started applying them to my knee. Hilda wrapped my knee with more strips of palm fronds and tied it very tight. I wasn’t sure what to do. From my past experience, this definitely looked like a bad enough cut that it could use at least a dozen or so stitches. At the same time, I completely trusted Hilda’s medicine. We all walked together back down the road to Maya Belle. The cafe there was already closed so we all piled into nearby hammocks to enjoy the night sky and listen to the jungle sleep. Early the next morning, the brothers from Austria joined me for some mushroom hunting in the cow pastures. These are psychedelic mushrooms like I’ve mentioned before, only these grow in the cow manure. Same species that grows in the United States, only the effect can be very different. I’m told it’s because the cows there eat much different plants than the cattle in the U.S.
We left early because if you don’t, the caballeros (Mexican cowboys) will have picked them all to sell to the backpackers. We were out there early enough, stomping through all the mud, picking out stickers, scraped by thorns, sweating from the intense humidity, etc. After we all had a nice bag full for us and our compadres back at Maya Belle, we headed back toward the main road. Only to be met by caballeros who demanded we hand over our bounty or pay them. Dang! All that work and we had to pay anyway. Next time we’ll just sleep in and wait for the caballeros to bring them to our hammocks instead of dealing with all the mud, manure, thorns and stickers. Later that afternoon I wandered back down to Hilda’s place for some food and drink. Hilda greeted me and asked how my knee was doing. I told her it seemed fine and I’d almost completely forgotten about it. The tied frond wrapping was pretty frayed but still holding together. Hilda said I could go ahead and take that off now. I pulled out my pocket knife and cut the frond and dressing off. What I saw was absolutely incredible. There wasn’t even a scratch. It was as if the wound hadn’t even happened at all. I looked up at Hilda in amazement. Literally couldn’t believe my eyes and started searching all around my knee for evidence. All perfect, no markings at all. Hilda just smiled and returned to cleaning the bar. She grinned and then disappeared into the kitchen area. The next couple of days leading up to the day of the eclipse were mostly hanging in hammocks, reading, hiking in the jungle, and telling each other stories of Mayan lore and myths. One evening I joined the anthropologist in Indiana Jones attire, for a hike in the jungle behind Maya Belle. There are several footpaths in the jungle that I’m told lead to some Lacandon indian villages. The Lacandon are considered to be decendants of the Mayans. Many of the paths eventually take you to the ruin sites. I’d told Indiana Jones that I knew of one trail that takes you to a place called “The Queen’s Bath”. No clue why they call it that, but it’s a nice set of waterfalls in the jungle that form a pool beneath you can swim in. Perfect way to cool off under the canopy of the jungle. Not far into the jungle, Indiana started hacking away at vines Indiana Jones style with a cheap machete he’d bought in down. The trail was pretty clear so I don’t know why he felt the need to whack away at vines, but he wasn’t wasn’t harming anything. Until, one of the whacks disturbed a huge snake the was wrapped up in the thick vines above. Indiana dropped like a rock and turned white as a ghost. The size of the serpent started me a bit too, but there was enough distance that I wasn’t too worried. Indiana started fumbling around in his pockets to retrieve a cigar and a lighter. His hands were shaking uncontrollably, so I took the lighter and held it while he puffed. He puffed away creating a thick mass of smoke that encircled us. I’d never heard that before, but it made sense. Besides, even though I’m not wild about the smell of cigar smoke, whatever Indiana was smoking had a decent aroma. And, it made our hike to the Queen’s bath for a swim, a little more “Indiana Jones” like. Finally, the morning of the eclipse had come. Every day leading up, there were more and more people arriving. I didn’t know where the others had gone, so I walked down to Hilda’s cafe for a coffee and to relax before going to the ruins for the event. Hilda was busy cleaning up around the cafe. I got into one of the hammocks to read for a bit, when Hilda came over and told me that I would be coming back to the cafe to do her a favor. Hilda smiled, nodded, then returned to her cleaning. I didn’t really plan on walking back. It wasn’t all that far, but in the tropical heat it was a bit of a hike. And, I’d have to walk the distance twice since the ruins were the opposite direction away from my palapa at Maya Bell. There were a few others hanging out in the cafe by that point. Someone was playing a bongo drum, and another person was banging on one of tables like a drum. It was getting a little hard to concentrate on my reading, so I waved to Hilda and walked back to Maya Belle to chill out in my own hammock. Fell asleep reading back at Maya Belle. When I woke up I briefly panicked because I thought that after everything, I’d ended up sleeping through the eclipse! Happily, I still had a good hour and a half to go. Tried to tell myself it’d be cutting it too close to try and hike back to Hilda’s before the eclipse, and that she’d understand that I’d fallen asleep. But, I knew that was a lie. I easily had enough time to go back to the cafe to find out what favor she needed me to do, and still make it to the ruins for the eclipse. After grabbing my daypack, and some water I headed back to Hilda’s cafe. When I arrived it was completely empty. No one around at all, but I could hear some Indian Hindu music playing over the speakers. Figured someone must be there so I sat down at one of the tables and called Hilda’s name. From the garden behind the cafe, Hilda came toward me smiling and dancing seductively to the Hindu music. She had changed clothes and was wearing a flowing saffron-colored sari. Her hair was bound up like a turban in a matching lace scarf that had small amber charms dangling from it around her face. And, she had a small colorful parrot perched on her shoulder. I watched her move and twirl about. She almost looked as if she was in some sort of a trance, and that trance was starting to feel like it was having an effect on me as well. Hilda motioned for me to stand up and follower her as she danced out of the cafe and into the adjoining cottage. I’d never been in the cottage, but was surprised how sparse the decor was. In the main room there was almost nothing but a beautiful white hammock that was hung from one corner of the room all the way to the opposite corner. She motioned for me to continue following her into the bedroom. This made me a bit uncomfortable… as I obeyed and followed her into the bedroom. I wasn’t sure what was about to transpire. Hilda motioned for me to sit back on the bed as she continued to dance and twirl. While dancing, she scooped up a deck of large tarot cards on a white dresser. Everything in her place was white. She started shuffling the tarot cards as she danced and then suddenly flung them all across the bed. She instructed me to select a card. I told Hilda that I didn’t want her to read my cards… that I knew of someone who was told they would get cancer from a fortune teller. This person did in fact get cancer and I never knew for sure if it was because the fortune teller actually foresaw it, or if it was the suggestion itself. Hilda told me not to worry, that she was not going to read my tarot cards. She instructed me to pick one card and look at it, but don’t show it to her. Then, mix the card back into the rest of the cards, and then shuffle the deck a few times. After I shuffled the deck about 3 times, I handed it to Hilda. After she also shuffled the deck 3 or 4 more times, she quickly flung the deck back onto the bed and the cards all spread out. Instantly, she reached down and plucked a card from all the cards and turned it around toward me. I examined the card and it had a figure holding up the sun I believe. Hilda took the card from me and rolled it up in a long piece of muslin cloth. She put the wrapped card in a cotton bag, along with some oranges, and some calla lilies. I think there were some other small items she put into the bag as well, and handed it to me. The time was getting a bit short, but I still had enough time. I just couldn’t dawdle much and had to walk quickly. The closer I got to the main entrance to the Palenque ruins, the more people there were. It looked as if they’d all arrived today and what a bizarre bunch most of them were! Like some strange multi-cultural, international convention of astro-space aliens from the planet of dreadlocks and tie-dye. So many in fact, that I didn’t think there was any way possible that’d I’d be able to find a person who I didn’t know their name or what they looked like. All I knew was that it was a she and that she was from Nebraska. Just after I passed the largest Temple of Inscriptions pyramid on my right with the observation tower complex on my left, I had sort of a “knowing” or intuition that the woman I was looking for was on the top floor of the stone ruins tower. At the entrance of the tower there were two men in suits. I couldn’t make out where they were from, but they they spoke English with a foreign accent. I nodded to them as I passed into the entrance, when they held out their arms to block me. The two men looked at each surprised. Whoa, that was weird. How did they know? I didn’t ask anymore questions and started up the narrow stone stairway to the top level of the tower. At the top level, the walls are open on all four sides with the roof supported by 4 stone columns. There were 7 people sitting in a circle chanting with a light-haired woman presiding. She looked to be in her early 40’s and looked… well… like she might be from Nebraska. All of their eyes were closed. I didn’t recognize the others except for the man with the turban I’d given directions to a few days prior. The woman from Nebraska opened her eyes, looked at me and smiled as she nodded. It felt a little bit awkward, like I was interrupting something. So, I took the bag Hilda had given me and set it down in front of the woman from Nebraska. She closed her eyes again and joined back in with the chanting. The language they were chanting in wasn’t familiar to me. For a short while I stood in the corner and watched, then quietly backed out, down the stairway, and continued out to the grounds to wander around the ruins site. It seemed that most of the people at site were of the strange variety I mentioned before. Mostly of the bohemian sort and they were all performing various rituals that involved dancing, singing, chanting, and there was a bit of primal wailing as well. I didn’t have any eye protection, so instead of trying to view the eclipse directly I focussed my attention on all of the bizarre spiritual circus taking place all around me. 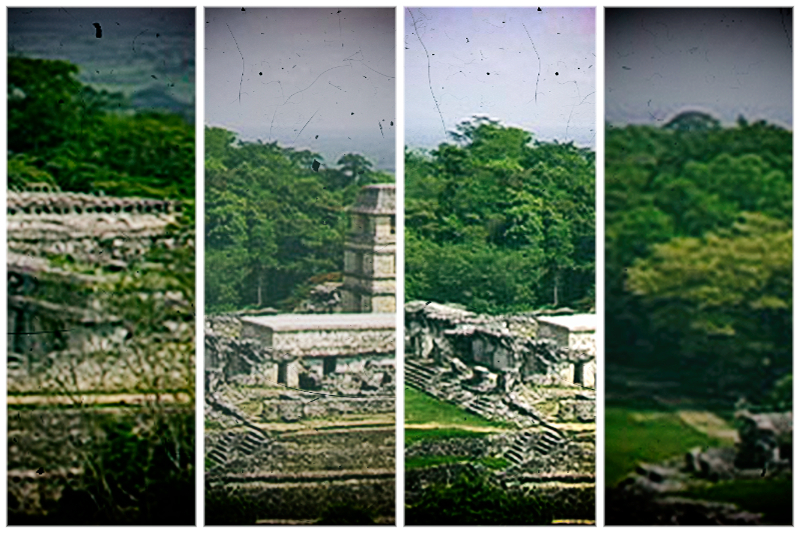 At Palenque, the eclipse wasn’t total, but it darkened to about twilight. The entire surrounding jungle erupted into a cacophony of buzzing night sounds with howler monkey drones. Most of the singing, drumming, and wailing raised a couple octaves in pitch as it blended into the jungly symphony. Time felt like it stopped, or at least the perception of time did. After what must have only been a few minutes, the light brightened as the sun shone full again. There were gasps and some singing, but the tone was more subdued. The jungle sounds went back to a normal daytime nature, and there was a palpable spirit of peace in the air. I wondered around the ruins for awhile, and down the trail toward the Queen’s bath to cool off. Wasn’t quite sure how to feel about what had just transpired, but I knew I wanted to hang onto the feeling as long as possible. 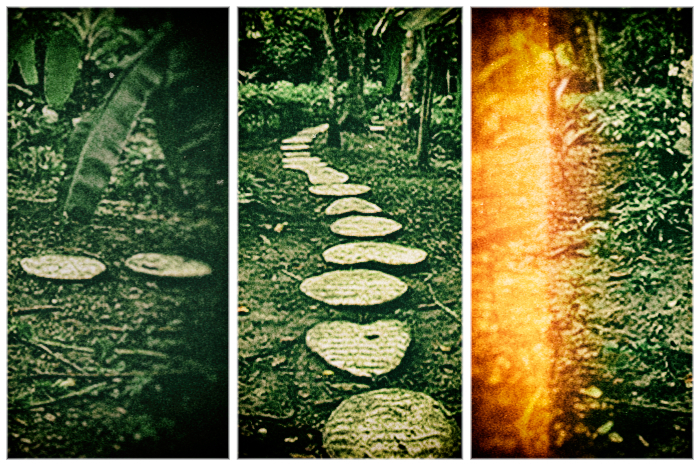 Some time later, I meandered down the jungle trail and back toward Hilda’s cafe. When I arrived, it appeared empty. I heard some voices behind the cafe. It was the hippy couple from Montana… of our little group. They acted like they were somehow still enchanted. I felt that way too. A lingering feeling. They asked me where I was for the eclipse. We all walked back inside Hilda’s cafe where there were several people gathering. Hilda smiled and was putting out some food and drinks. I saw the woman from Nebraska talking with some others from the circle. Said my goodbyes to the group after we compared stories of the seven card… the Sun Card, on the day of the eclipse. I shook everyone’s hand including the woman from Nebraska, and a kiss for Hilda. It was difficult to leave just then, still processing the events of the week, and this incredible day… but, I’d made it all the way up to the day of the eclipse with barely a peso to spare. I’d already purchased my bus ticket heading toward Mexico City, and on toward the Texas border. It’s a long trip and I couldn’t drag my feet anymore. I’d already packed my backpack and only needed to catch a collectivo taxi to the bus station in the town of Palenque. On my way out of Hilda’s cafe, I saw the man with the turban with his giant, ancient holy book opened. He was reading a passage to himself, but in a language I didn’t recognize. Then, he spoke to me in English. The bus trip back North was a long, uncomfortable, marathon of a journey. Did the whole 33 hours or so, in 3 hops. Overnight 12 hours to Mexico City, then another 16 hours overnight to the border, and another 5 hours from the border back up to Austin, Texas. Barely even noticed the trip at all. I was still in that state of wonder I think. Replaying the events and what they’d meant. Still baffled as to why the woman in white muslin would try to poison a complete stranger. Or, how a few carefully selected jungle plants could heal a long, deep gash in my knee overnight without even evidence of a scratch remaining. Or, what any of that ceremony related to the seven Sun tarot card on the day of the eclipse meant. I think what meant the most to me though, out of all the entire trip, was the realization that sometimes… likely most of the time… it has little to do with you. Your purpose isn’t always related or even meaningful to your own personal story, but instead you may be playing a crucial role in a much larger narrative that you may never completely comprehend.